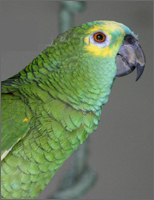 Green Parrots are very common birds found as pets. Green Parrot is not just a particular kind of Parrot. 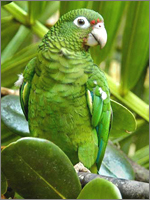 There are many Parrots that are termed with this name because of the bright green color of their feathers. A Green Parrot can be a Parakeet, a Senegal, an Amazon or even a Sun Conure. Among all kinds of parrots, there are many which can be termed a Green Parrot. This is because of the color of their plumage. Green Parrots are found in the temperate and moist regions of Southern Hemisphere. The greatest diversity of Green Parrots is found in South America and Australia. The Green Parrots have a piercing shriek that they will use to draw attention to themselves. They also have sharp environmental orientation level that sometimes tends to make them jumpy or nervous and attentive for predators. Many Green Parrots learn to speak some and many will imitate noises. A pleasure to look at, Green Parrots are intelligent, amusing and affectionate. Green Parrots are very easy to train. However, an untamed Green Parrot can be highly annoying and irritating. 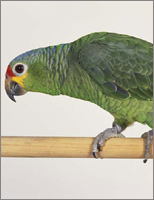 Green parrots can be trained to talk and perform amazing tricks. However, it is not easy to train all Parrots. They are intelligent, graceful and often moody birds. The owners need to be patient and persistent.